It is hard to find good hymns to sing in conjunction with the administration of the sacrament of baptism. Hymns from the Roman and Lutheran traditions tend to say too much and hymns from the Baptist tradition tend to say too little. 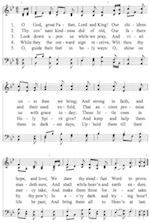 Below is biblically-balanced hymn written by Elijah Embree Hoss (1849-1919), a minister in the Methodist Episcopal Church. It is here set to the tune “Retreat” written by Thomas hastings (1784-1872). You can listen to the tune by using the player. Note: Pastor McShaffrey slightly modified the lyrics to fit better with the phrasing of this particular tune. O God, great Father, Lord and King! We dare Thy steadfast Word to prove. And shall while heav’n and earth endure. And make them Thine for Jesus’ sake. Wilt Thou Thy Holy Spirit give? In every dark and trying hour. And bring them all to Heav’n at last.